Seven years ago, I made a No Bake Peanut Butter Pie. And seven years later, I still think about it once a week. Not just because I love the combination of creamy peanut butter and chocolate, but also because it was possibly the most dangerous, decadent, delicious dessert I’ve made. So, I made the peanut butter pie again. The Peanut Butter Honeycomb Pie was beyond addictive. It had a crunchy graham cracker crust and a rich, creamy, slightly salty filling that just beckoned you to take one… more… bite. For two days, I stole bites of it from the fridge until I insisted that my then boyfriend take it to his house. It lasted two days there before he bought it back to mine, confessing that he couldn’t stop eating it either. So, we gave it away to friends as quickly as we could. That no bake pie was one tempting son of a gun. Fast forward to yesterday. I made the no bake pie again. But this time with a few alterations. I used the delicious Simple Truth No Stir Crunchy Peanut Butter instead of the creamy variety to give the filling more texture. To make it easier to bake at home, I swapped the whole vanilla bean for vanilla extract. I replaced the ¾ cup of butter with 1 cup of nonfat Greek yogurt. I loved the no bake pie with the graham cracker crust, but I’d just made one of those for the 4th, I swapped that for a chocolate cookie crust made from Simple Truth Chocolate Sandwich Crème Cookies instead. (You can get the cookies and the peanut butter at Ralphs, part of the Kroger family of stores). And, yes, technically you bake the crust… I guess you don’t have to… but I prefer a crunchier crust. I’ve made other chocolate peanut butter recipes, like these Peanut Butter Pretzel Cookies, Peanut Butter Chocolate Overnight Oats, and Chocolate Peanut Butter Cupcakes, but honestly, this is a whole new level. It’s a make and bring to friends immediately kind of no bake dessert. If you’re looking for a peanut butter pie without cream cheese, look no further. This is it. When in doubt, keep whisking. After whisking the egg yolks + sugar together for one minute, there will still be visible yolk. After you scrape the sides and whisk for one more minute, it should look “thick.” When you tilt the mixer head back, a “ribbon” should drizzle back into the mixture. You also need to whisk continually when the pot is on the stove. Otherwise, your mixture will overflow or the eggs will curdle. Use the guard. If you have a guard for your mixer, use it. You know in those superhero movies when one hero turns to the other and says, “Now would be a good time to use your superpowers!” It’s like that. This one doesn’t cause you to fly or anything, but it does prevent hot milk from flying all over the kitchen and into your eyeball/all over your computer. If you do not have a guard, I sometimes make a makeshift one by taking two paper towels and wrapping them around the mixing bowl. Use your favorite peanut butter. Now is the time to use the good stuff! I used the Simple Truth Organic No Stir Crunchy Peanut Butter to give the pie’s creamy filling a bit more texture. I love the organic Simple Truth products because they’re free from 101 artificial ingredients preservatives, so they help me eat a little bit healthier. You can use the variety that’s just peanuts and salt, but it’s won’t firm up quite the same. I recommend getting a jar of that and saving it to make peanut butter sandwiches instead. Go nuts with the toppings. How you decorate this creamy and delicious dessert is up to you! I chopped 20 chocolate peanut butter cups into halves and quarters, melted ¼ cup of chocolate chips in the microwave, and rough chopped ¼ cup of roasted peanuts and drizzled and sprinkled it all on top. But you could top it with whipped cream or chocolate cookie crumbles! Keep it in the freezer. Perhaps because the pies uses Greek yogurt instead of butter, it gets super soft if you keep in the fridge, so store wrapped in foil in the freezer. Ask for help! Look, I’m the first to admit that this is not the easiest peanut butter pie ever. Most So, if you get stuck, hit me up on Instagram at @letseatcakeblog. I look at all my DMs and answer pretty quickly! See More of Our Easy No Bake Pies! 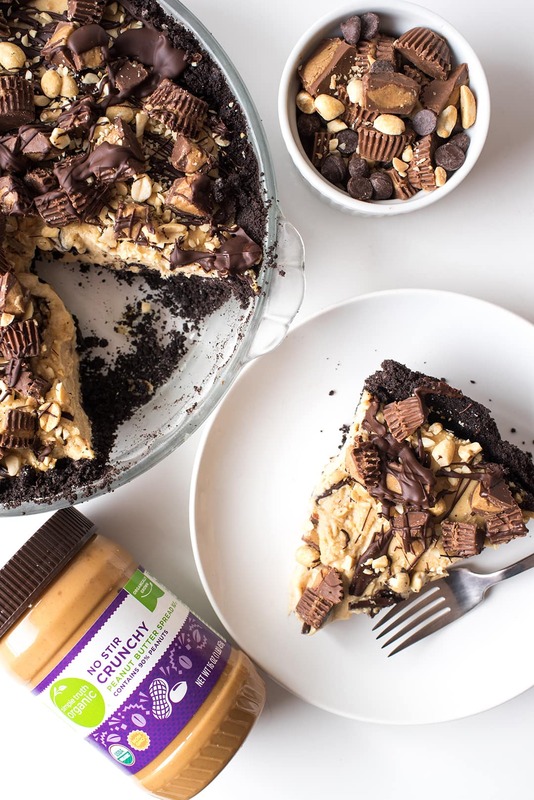 This No Bake Peanut Butter Pie combines two of the best things ever: Chocolate and peanut butter. 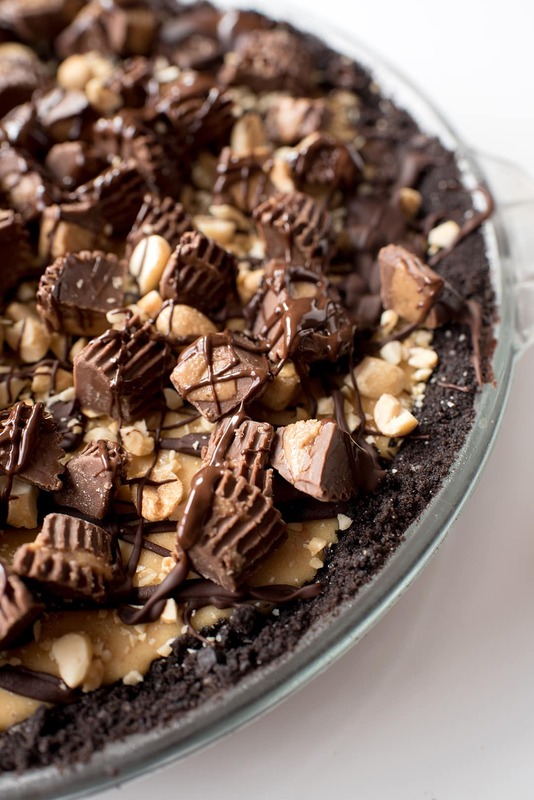 It has a chocolate cookie crust crust and a rich, peanut butter filling! Crush or food process Chocolate Sandwich Crème Cookies. Combine cookies with butter until fully mixed together. 1. Beat egg yolks and 6 tbsp. sugar in electric mixer fitted with whisk for 1 minute at high speed. Scrape sides and beat for one more minute until you see a steady stream or “ribbon” when you lift the whisk. Add vanilla extract. Mix on high speed for 30 seconds. Combine milk and 6 tbsp. sugar in small saucepan and bring to a boil over medium heat, whisking continually. Remove from heat and let cool for one minute. Place guard on mixer and pour the milk mixture into egg mixture with mixer running on medium high speed. Once combined, pour mixture back into saucepan. Bring milk mixture to boil over medium heat, whisking continually. Remove saucepan from heat, carefully pour into mixing bowl, and beat on high speed until cool, about five minutes. Switch whisk to paddle attachment. Place Greek yogurt, peanut butter, and salt in mixing bowl. Mix on medium speed until combined. Place in freezer for 2-3 hours until solid. Decorate with topping if desired. 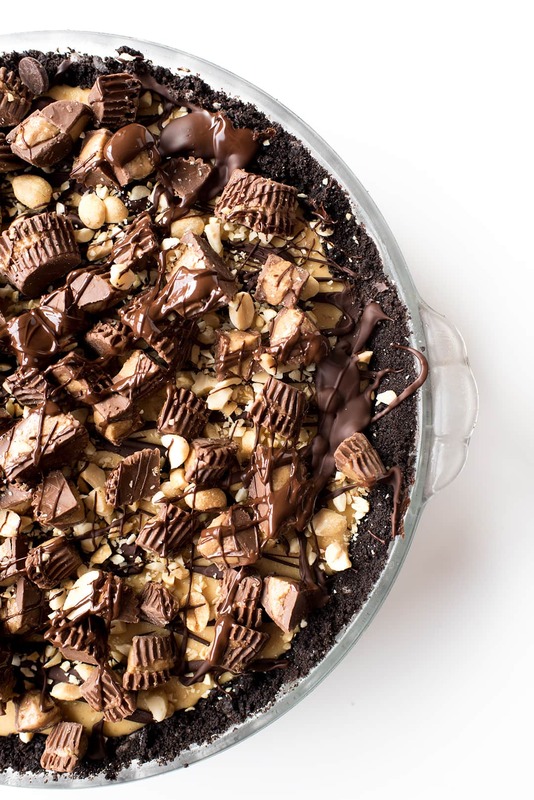 If you prefer a truly no-bake pie, place the chocolate crust in the freezer while making the peanut butter filling instead of baking it in the oven. Calorie count does not include the topping. oh this is dangerous!! I love peanut butter pie and the toppings you put on this make it killer! It is! It’s a take-immediately-to-a-party kind of pie! No bake desserts are perfect for summer! This is so easy and looks delicious! Thank you! 🙂 I had to take it to work to stop eating it! YUM! This pie looks amazing! I love chocolate and peanut butter together – it’s simply the perfect combo in desserts! This is such a great pie and so easy to make. Delicious. I need to make this recipe ASAP! Yummy! I am completely drooling over this one! Oh, wow, decadent is right! I totally want to dive in. Peanut butter and chocolate cookie, is there anything better? This no bake cake looks very tasty! I love peanut butter so much, I think ill really have to give this a go 🙂 – Thank you! No-bake pies are so perfect for summer when I want to never use my oven! This recipe is so yummy, love all the chocolate! This looks so good! If I had this pie standing in my fridge I would steal little bites all throughout the day and then blame my husband for the missing pieces! Haha.. seriously! That’s what I do. Love this recipe! Of all the no bake peanut butter pies out there, this might be the most decadent one I’ve ever seen! Gorgeous! The pictures are a absolute delight and so is the recipe. Am so tempted to try this .On top of all, its a no bake pie,which make its just perfect.thanks for sharing. This looks so rich and decadent. What a showstopping dessert! This pie looks gorgeous. Wish I could grab a slice right now. Perfect summer treat! And that crust looks perfect. My kids are surely going to love it !! I’m sure after I make this pie I will be thinking about it weekly too! This looks amazing, perfect for peanut butter and chocolate lovers. This looks delicious and I love the fact that it’s no bake. Perfect for this time of year! YASSS! 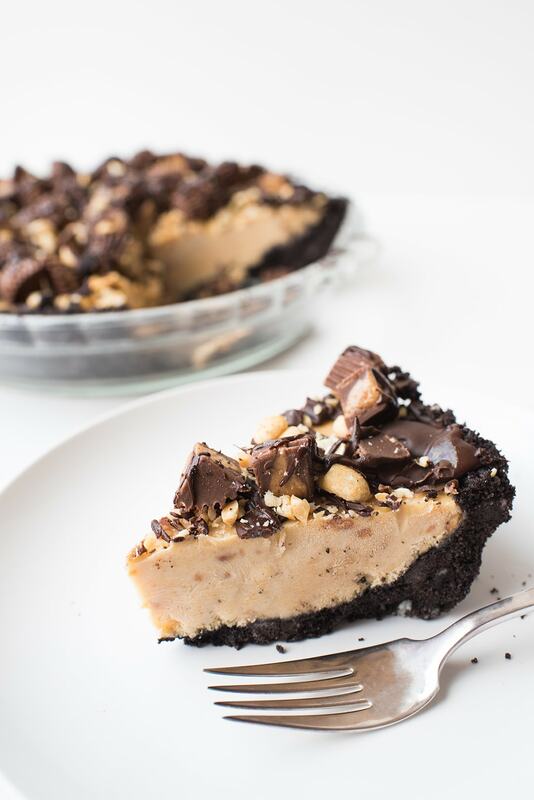 This peanut butter pie is definitely calling my name! Love these no-bake recipes as we battle the summer heat here in Los Angeles.